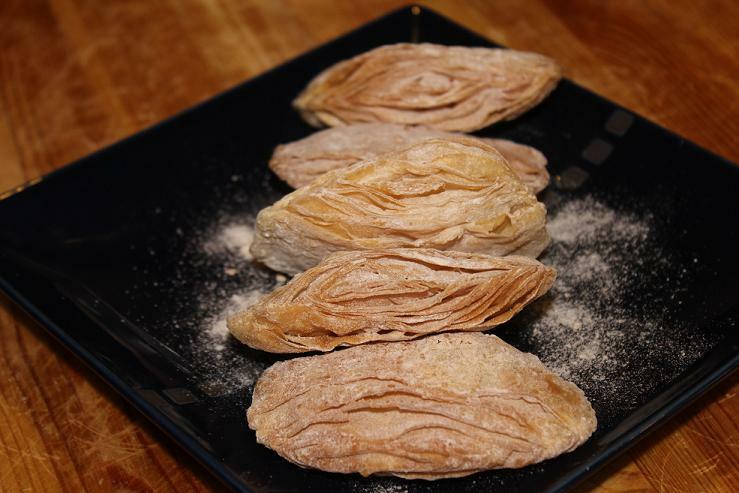 Sangha Bhaley is a favorite treat for Tibetans from Lhasa, Tibet’s capital city – it’s a special type of Tibetan khabsey. Loosely translated, sangha bhaley means “one srang bread” – I am told that it is probable a handful of these types of cookies or bread were once sold for a srang and that’s how the name came about. Sang (srang) is a Tibetan monetary unit from pre-1959 – Srang is a silver coin and “srang gang’ means “one srang”. Pre-1959 Tibetan money, issued by the government of Tibet, included bronze, silver, gold coins and printed paper notes. Silver coins came in denominations of one, three, five and ten Srangs. I found some good information on historical Tibetan monetary system on Wikipedia. There’s also this interesting survey on Tibetan paper currency by Wolfgang Berstch. 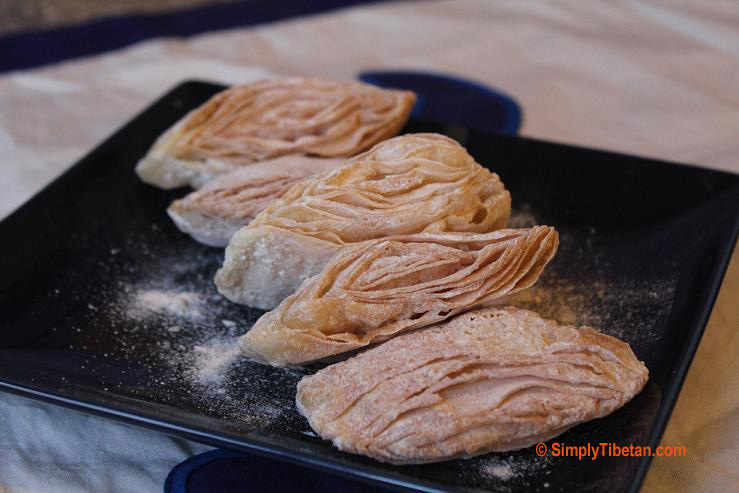 But back to food, there are a couple of different types of Sangha Bhaley but the most commonly made ones in Tibetan homes are those scrumptious, delicate ones with dozens of paper thin layers topped with a sugar coating. I’ve tried to learn how to make these from a number of friends but have never been able to perfect the craft. These cookies are quite delicate and require some precision cooking. The best ones in our area come from our friend Thupten Tsering la’s kitchen and I was truly delighted when he accepted my invitation to share his recipe on Simply Tibetan. Moving to US almost two decades ago, Thupten la found himself craving many of the familiar tastes and treats that he’d grown up eating in Lhasa. Unable to find them or buy them anywhere, he began experimenting with ingredients available in western markets and learnt to adapt & improvise, slowly recreating Tibetan foods like Sangha Bhaley for himself and others to enjoy. 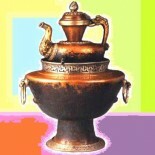 With regards Sangha Bhaley, Thupten la has an interesting story to share. Back in Lhasa, Thupten la’s mother usually made Sangha Bhaleys for special occasions and he always assisted her. One year, just around the time of Losar, he remembers a woman from a visiting Tibetan dance troupe stayed as a guest renter in one of the rooms in their family compound. She happened to have a free day per chance on the day they were making Sangha Bhaleys and his mother invited her to join them. To the everyone’s delight, this lady turned out to be a real Sangha Bhaley specialist, and she showed them some important Sangha Bhaley techniques including kneading the dough with very hot water. The perfect Sangha Bhaley has multiple layers of paper thin pastry and is so crisp and that it falls apart as you bite into it. (The only comparison I can think of is biting into a layers of chips piled up together). The proper etiquette to eating Sangha Bhaley is to hold the palm of one’s free hand under the mouth as one takes a bite – in order to catch the sugar powder and crispy bits that fall off the side as you bite into the cookie. For every recipe, there are important tricks or techniques that one learns only after cooking shoulder to shoulder with a seasoned cook. 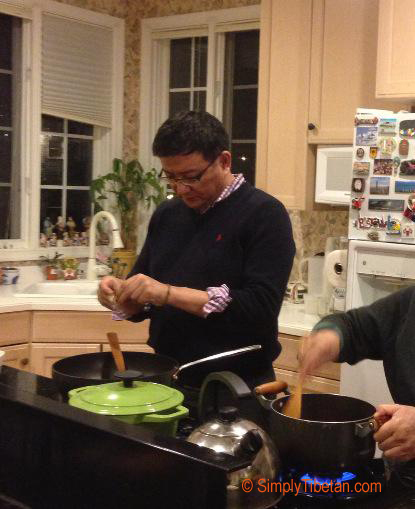 So, Simply Tibetan would like to thank Thupten la for cooking with us and sharing his family’s Sangha Bhaley recipe. 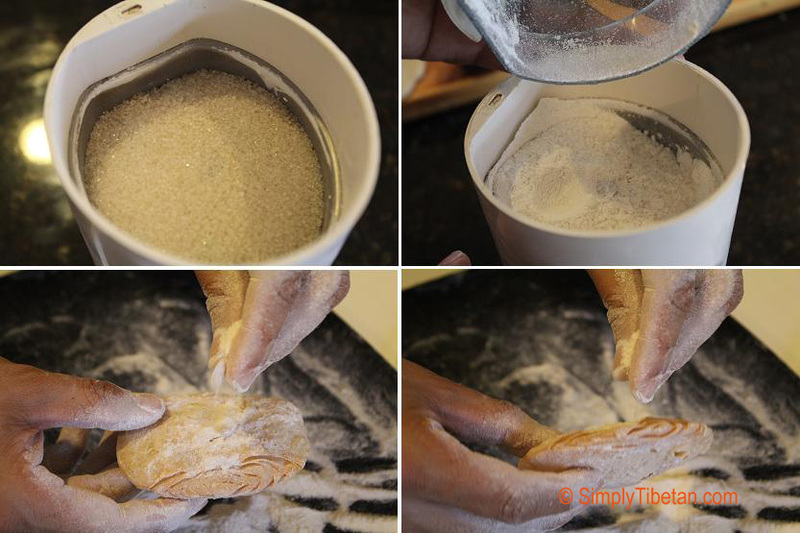 Put the flour in a large bowl, slowly add hot boiling water stirring with a ladle mixing in the water to form a dough. Once the dough is formed, slowly handle it with you hands – it’ll be hot but gently start adding a little pressure and knead for a few minutes until it is the consistency of momo dough – not too dry but smooth texture. Cover and let sit. You need a cooking utensil for deep frying – Add a decent amount of the shortening into it and put it over a medium flame. It is good if the oil for deep frying has about 3” depth. The oil needs to be very hot. 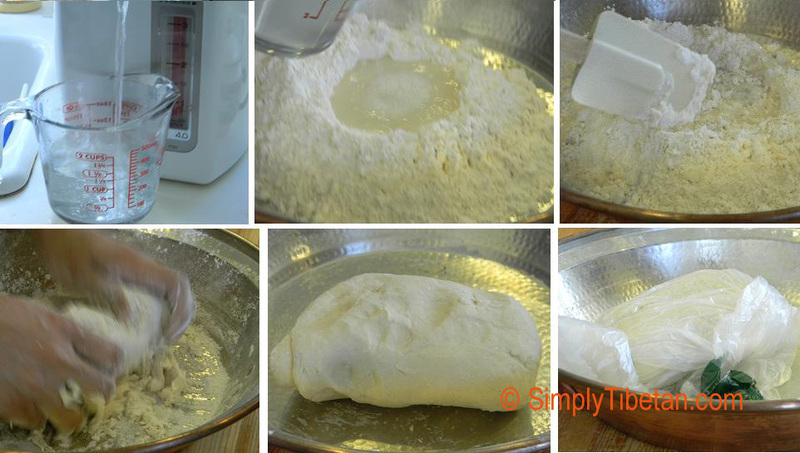 Divide your dough into four portions. There are two ways to do it from here – with the extra help of a noodle maker or manually on a kneading board. Manually on a Kneading Board: Roll out the dough as big and thin as you can make it – lightly dusting the surface with flour helps if the dough sticks. Roll the dough till its about 22 inches long to about half the width. Slice of the rough edges along the side to make a long rectangle. 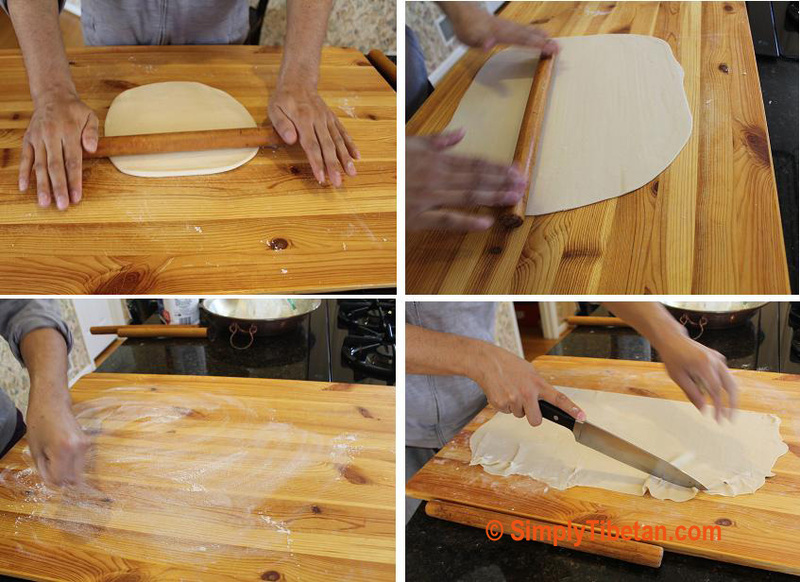 With Noodle maker: Flatten the dough and run it in the Noodle maker to form a long thin flat dough. With TT’s machine, we started at #1 and stopped at #3 setting. Cut it into about 20”to 22” strips. Oil generously with the melted shortening leaving about 1” at the top oil free. Beginning from the bottom end, near you, gently fold over the tip of the edge and start rolling the dough all the way to the top into a long narrow tube shape. Slice of the rough edges of the rolled up dough. 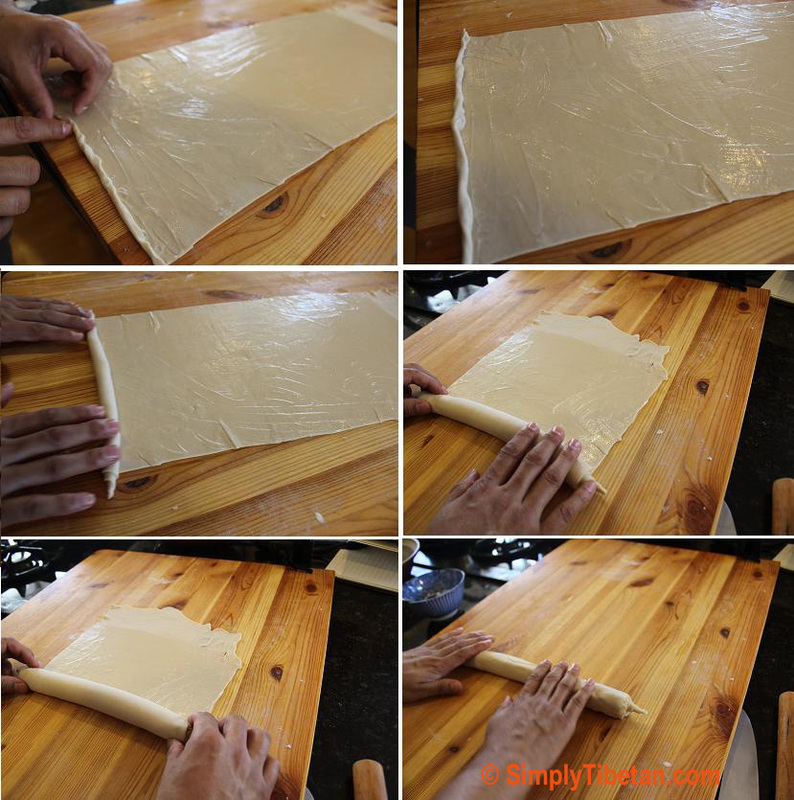 Beginning from one end, cut ½” size slices from the rolled up dough. Each 1/2” slice will make one Sangha Bhaley. Pull once aside, gently flatten the top with your index finger, then flatten it will a rolling pin to make it about 2”x3 ½” flat shape. Make a number of these and then you are ready for frying. Heat the oil until it is very hot almost smoking. 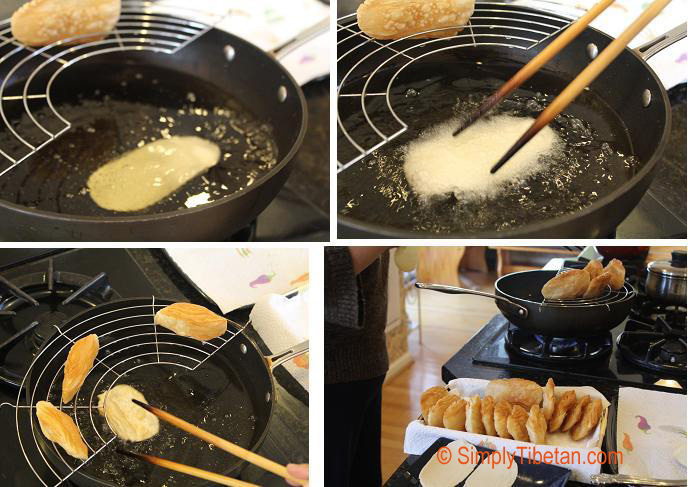 The cookies have to be fried one at a time … use a pair of long chopsticks – maneuvering the cookie as you slip it into the hot oil. Press down on the two side edges, allowing the cookie to expand in the middle. Flip it over and do the same. Then turn it sideways, and hold it with the chopsticks, allowing the oil to get in between the layers in the middle. Its ready when its golden brown. Take it out, and leave it standing on the side. Its important to let it sit near the stove where its warm, so that the oil continues to drip down. If left in a place further from the stove, the oil may harden and not drip completely. Lastly, it’s time to sugar the cookie. This is done only when the fried cookies are completely cooled down. In fact, it is good to store the cookies without sugar, adding the sugar only when its time to eat or share. TT grinds regular white sugar into powder, and adds this the khabsey. Each Sangha Bhaley is carefully and generously sprinkled with powdered sugar – on both sides and in between. Now it is ready for your enjoyment. Finally, here are four short video clips to help you see how it is done. 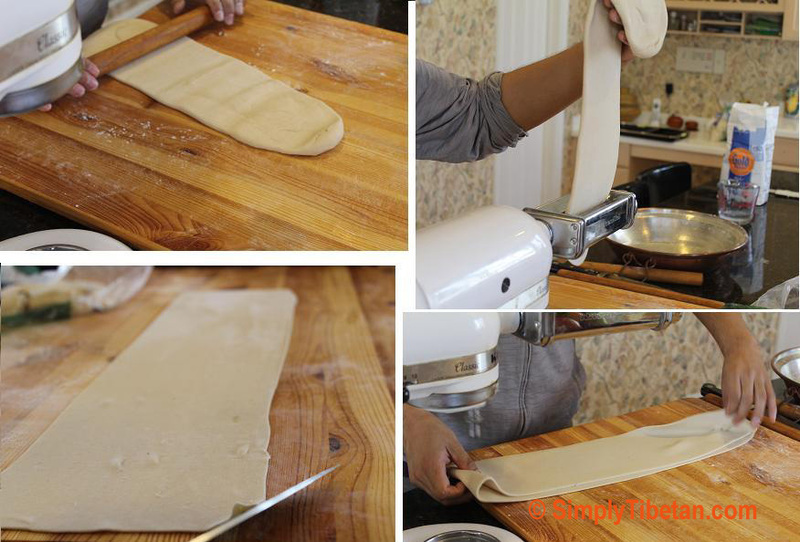 Video Part 1 – shows step 3 – how to make the flat long dough with Noodle machine. Thank you so much for posting how to make sangha bhaley, I have been trying it for every year but it always turns out to be thick one. Thank you so much for keeping alive Tibetan culinary art, Tibetan food is so important part of our tibetan culture, please make lot of youtube videos of different Tibetan dishes. Thank you genla, i’ll try to make it. And happy losar. Well, I tried to make it today but it didn’t come out as crispy as yours. What did I do wrong? I used crisko for deep frying & followed exactly as per your steps. Mine is crispy only outside but not inside & it wasn’t puffing up like yours. Please help me to clarify what went wrong in my steps. I really love sangha baklep & like to learn making it better for my family. Thank you. Wow, I will definately try to make this sangha baklep. Thank you for posting & your video tutorials. Truly appreciated. Thank you very much!! Just tried it today!! Used to have it ages ago when I was little girl studying in Kalimpong India… Was yummy and recipe worked out so good!!!! Thanks for such a lovely recipe of Tibetan food and now on this winter vacation I will try to make Sangha Bhaley. Thank you so much for posting these recipes. This Losar I tried to make Sanga Bhakleb by following your recipe and if came out perfect. wow…its completely different from Bhutanese shbaa lay…. Thank you both for this great recipe. I will give it a shot today!! Growing up in mussoorie home#24, we used to make a slightly different version of sangha baley that seemed more labor intensive and I tried making it but hardly turns out as good and crispy as it should be!! So, wish me luck and thanks much!! 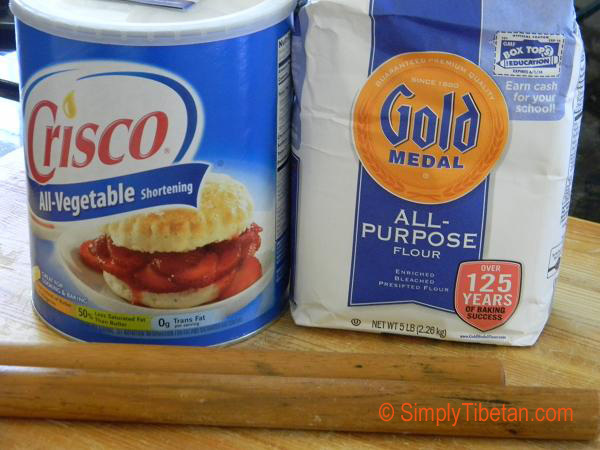 This entry was posted on February 17, 2014 by simplytibetan in Recipes and tagged khabsey, Khasey, Sangha Bhaley, tibetan cookie.